Munsell Color System; Color Matching from Munsell Color Company > color-blog > Munsell Color Order System: What is it and How is it Used? 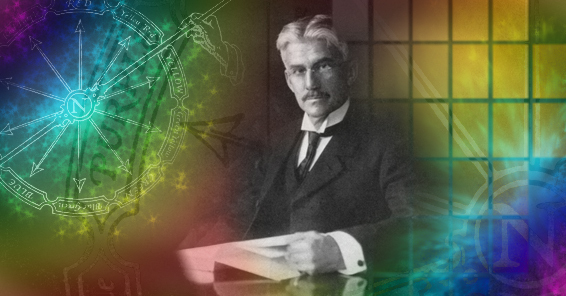 The Munsell Color System was developed in the late 1800s by Albert Henry Munsell, who was an accomplished artist and educator who also had a penchant for science. He was confounded by the lack of a meaningful way in which artists could consistently and effectively communicate color. His goal was to develop a system as orderly and effective as that used to teach music. So, similar to music—where each note is comprised of pitch, intensity and duration—each color is comprised of hue (H), value (V) and chroma (C). Hue represents the basic color, value represents the lightness or darkness of a given color, and chroma is the brightness or saturation of a given color. Each color is assigned a numeric notation based on HV/C. Taken a step further, Munsell’s three-dimensional concept of color is organized much like a globe. The circumference is comprised of hue (red, orange, yellow, green, blue, indigo and violet . . . yes the ROY G BIV you learned in middle school science! ); the axis is comprised of value (white at the top and black at the bottom); and each radius is comprised of the chroma. 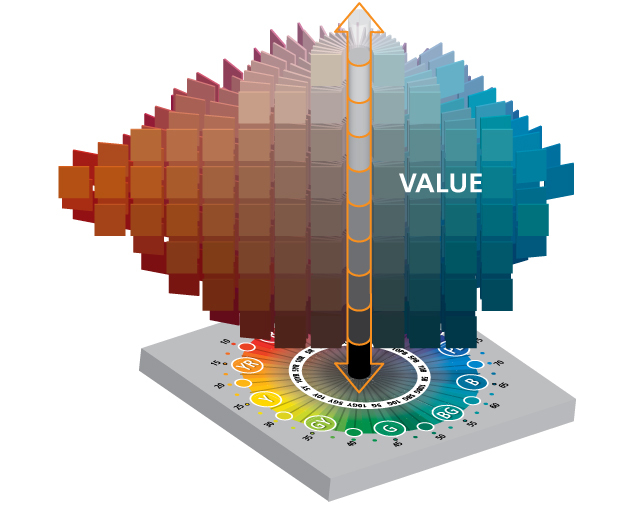 The Munsell system correlates to the way the human eye sees color and served as the basis for modern day computerized color matching systems, making it ideal for designers who specify color to manufacturers who use these systems. One of the Munsell system’s key advantages is the lot-to-lot accuracy of its books of color and individual color standards. That’s why it’s the system of choice for a wide range of industries and disciplines including Agriculture, Archeology, Education, Environmental Studies, Food Products, Geology, Government Standards, Industrial and Interior Design, Pharmaceutical, Product Development, and Safety. Munsell color communication standards help ensure consistent brand identity and product color standards from toys and tools to consumer packaged goods. Designers and brand owners use them to visually communicate color to suppliers, who also use the color communication standards to conduct visual color quality control assessments. Leading brands including Mattel, Black&Decker and Hoover have worked with Munsell to develop color standards that not only represent their ideal color but also acceptable variations of the color to compensate for the limitations of manufacturing processes and raw materials. Munsell government standards help the U.S. Department of Agriculture grade and timely harvest produce including olives and tomatoes among others. And every time you order French fries, thank Munsell for providing the color standard that ensures perfectly cooked fries. Munsell environmental color communication standards have been specially developed to help archeologists, botanists, geologists and scientists reveal clues about our environment. For example soil color near an archeological find helps archeologists identify the time period from which the artifact came. Geologists use Munsell color charts to help determine a parcel of land’s fitness for use. Finally, thanks to Albert H. Munsell’s roots as an artist, his color order system also correlates to the popular color wheel still used today. Each Munsell Book of Color—Glossy, Matte or Nearly Neutrals Collection—enables designers to develop palettes easily and serves as a handy reference for matching color. Learn more about the Munsell Color System including educational tools and color vision tests.